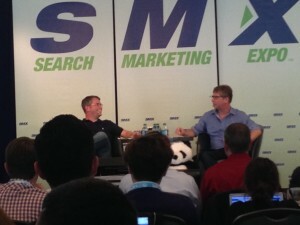 It’s the session we’ve all been waiting for: the You & A with Google’s Head of Webspam Matt Cutts. Next to plush hummingbirds, Cutts laughs with Search Engine Land Editor Danny Sullivan. I’ll keep up with the convo as fast as my fingers can type! Danny starts by asking Matt if there are any announcements, and with that, the session is off and running. Matt: Yes, there are a lot. One is that the second part of the latest aspect of the Payday Loan update will be coming soon. Probably later this week, maybe as soon as tomorrow. Danny: How is that different from the update last week? Matt: It targets different sites. This is looking at spammy queries instead of spammy sites. This update could affect sites that are doing counterfeit, for example. Danny: What happened to the MetaFilter site? Was it Panda? Matt: It wasn’t Panda. What happened is that it was affected by an algo update that wasn’t Panda or Penguin. Even though the site is slightly out of date, it’s a good quality site. Google is working to figure out how to improve the algo based on this incident. Google does not think that MetaFilter is spammy or has spammy links. Google had never sent a notification saying that MetaFilter was spammy. Matt announces that Google is trying to make improvements for the reconsideration request. They are looking into a way to make it clearer where the problems are for site owners. Now, when Google rejects a request for re-inclusion, the Google team member has an opportunity to fill out more details on an individual basis. Danny: With two different roll-outs in close proximity (Panda and Payday), people may become confused as to what update they were hit by. Danny thinks it would be great if, for example, Google would show in GWT what algorithm the site was hit by. Matt: Google has over 500 different algorithms so it would be difficult to do for every update. Matt agrees to think about giving that type of info in GWT. They do try to update people on large updates via tweet, but he agrees that it’s a good question and will consider it. Announcement by Matt: Google Webmaster Tools — it’s a good time to check it out. Google rolled out Fetch & Render which allows you to see what Googlebot sees for your site. They really are trying to make ‘fetch’ happen. Over the next few months there will be improvements in the robots.txt testing, more with site moves by making them better and easier, better reports, etc. Keep your eyes on GWT — lots to come. Danny: Has there been a Penguin update since last year? Matt: No, they’ve been focusing on Panda. Danny: Danny talks about getting an email from a person requesting a link removal. Come to find out, it’s a link that was spammed into a comment that they did themselves. The “link walk of shame” is a good punishment for the folks who did spam, but it’s becoming an issue for the sites they spammed. Why can’t they just disavow? Matt: Fair question. The work for ‘walk of shame’ does create more work for the site owners, but it’s tricky because they want to make sure the folks trying to do the right thing won’t be at a disadvantage to those who play dirty and ask for forgiveness. Danny suggests a two strikes rule — first time you’re forgiven … the second time not so much and time to do the walk of shame. Matt doesn’t seem keen on it, but the banter draws giggles from the audience. Soon thereafter, Matt announces that Google is working on getting IE8 referrers back. Danny asks if Google can give us the data in GWT such as a year’s worth vs. the 90 days currently available — why hold our data hostage? Matt basically sidesteps this question and gave no immediate answer as to when more data will be available. Danny: Is link building dead? Matt: No, it’s not dead. There is a perception that links are hard to come by and many are nofollowed. That’s not true. A small percentage of links are actually no followed. There is still mileage to be had in links. If you do enough interesting and compelling stuff, the links will come to you. It’s easier to be real than to fake being real. Danny: Is it possible to assess a page without using links? Matt: It would be tricky but it is possible. Danny: Is Google using Author Rank for anything aside from in-depth articles? Danny: Are you looking at CTR, bounce rate and other engagement metrics in regards to ranking? Matt: In general, they are open to looking at signals but he will not spill the beans as to whether or not they look at the “engagement” of the site for rankings. Danny: When do sites get a boost for using secure ssl? Matt: Sites don’t get a boost for using https. Google used to prefer http over https, but Matt believes they’ve backed that out of the algo. Matt does prefer a secure web though. Danny: What’s the timeline on manual actions and their expiration? Matt: If Google does a manual action, you get a notification. If it’s a demotion it has an expiration on it. Minor infractions might have a shorter timeline. Major items have a longer timeline. If you wait long enough, they will expire. It expires even if the penalty isn’t fixed. Danny: Is the Knowledge Graph carousel going insane? Matt: I’ve never gotten trapped in the carousel but will look into it. Danny: Can you re-avow a disavowed link? Matt: Yes, upload a new disavow file that does not include the site. Danny: What is better for mobile? Matt: He tends to like responsive, but you can do all sorts of things. Google allows you to do any of the main formats and will accept them. Google’s mobile traffic will exceed desktop in the very near future. Asks for a show of hands for those who know if their mobile site is marked up for autocomplete. Minimal show of hands. Make your site faster, easier to use (including autocomplete, Google wallet, etc.) so that people can make transactions quickly. Danny: Is speed a ranking factor? Matt: If your site is very, very slow, it will hurt your rankings. Normal sites don’t have much to worry about. It’s in your best interest to make your site fast. Danny: What’s going on with negative SEO? Matt: We’re aware of it — because people are worried about it. The upcoming Payday update will help close negative SEO loopholes. Danny: What are your favorite Google tools? At this point Matt does a demonstration for wearable search with his phone on voice search for things like where the space needle is, how tall is it, who built it, restaurants near there, Italian restaurants near there and then finally navigating to the first restaurant. This shows that you can do multiple queries related to one topic and have Google understand the searches are all connected. Hummingbird helps connect all these searches into relevant information. Matt: Google can find them and follow them. You can also nofollow those links, too. Danny: Would you trust white hat link building companies? Matt: It’s possible to do white hat link building. Usually requires you to be excellent. Sweat + creativity will do better than any tool. Danny: Are there manual benefits? The opposite of manual penalties. Matt: No, there are no exception lists for Panda. Danny: Any last parting words? That’s it for the You & A with Matt! It is an optional on page markup that Matt suggests as a good user experience. It didn’t say that it was a ranking factor. This will use the visitors browser to help them complete the form. If you put then you will block this function. From what I could gather in the session, and Matt made sure to stress it several times, is that he meant to have any forms on your site which would require a visitor to fill out their information, auto-complete and simplify the whole process of them completing what ever task they are trying to accomplish. Whether that is filling out a contact form or completing a purchase – the point is to improve the user experience. Hope that helps to clarify! Thanks for this! Question: When you mention our site being marked up for “auto complete” and “auto complete in your forms,” are we talking about auto complete in a search bar on my website, or are we talking about the forms like lead forms?